Having set themselves above international law by bombing Syria without UN authorization, the US, the UK and France are now going calling on other countries to unite behind their fait accompli and endorse their actions. American, British and French ships and airplanes fired over 100 missiles at Syria Saturday morning, claiming it was in response to the alleged use of chemical weapons in the Damascus suburb of Douma. The three countries did not wait for UN authorization, or even for evidence from the scene: the international team of experts from the Organization for Prohibition of Chemical Weapons (OPCW) had just arrived in Syria to investigate when the missiles began to fly. As US President Donald Trump triumphantly declared “mission accomplished,” his French colleague Emmanuel Macron called for the UN Security Council to step in and pick up the pieces. 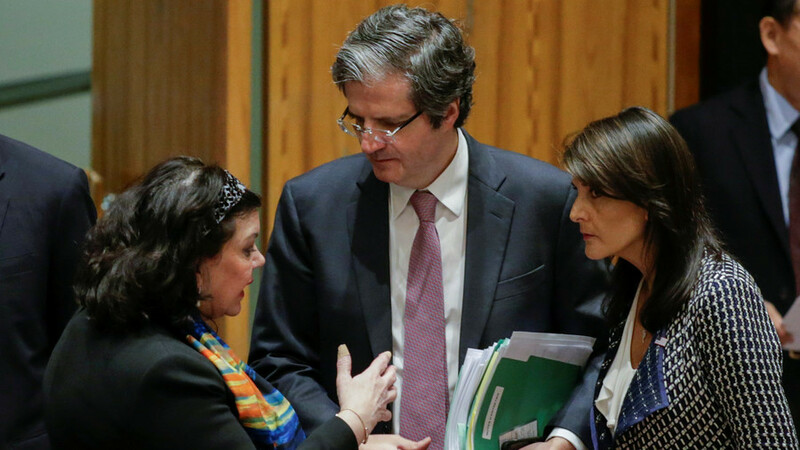 “It is now for the UN Security Council to unite and take initiative on the political, chemical and humanitarian questions in Syria,” the French presidency said in a statement after Macron’s teleconference with Trump and British PM Theresa May on Saturday. Russia, China and Bolivia voted in favor of the resolution. Four other members abstained, with Ethiopian representatives saying there’s no point in voting for a resolution that would be vetoed anyway. The US, the UK and France ‒ all permanent members with veto powers ‒ voted against, killing the proposal. Apparently, when Macron spoke of unity at the UN, he meant unity behind the actions of London, Paris and Washington. Canadian PM Justin Trudeau and German Chancellor Angela Merkel quickly endorsed their allies’ attempt to take the law into their own hands. One notable dissention from the EU and NATO position came from Italy. Rome would not allow the use of NATO bases on its soil for the airstrikes, but agreed to provide “logistical support” to the UK, the US and France. “Now is not the time for escalation, it’s time for diplomacy to give Syria democracy and pluralism after seven years of horrible conflict,” the outgoing PM, Paolo Gentiloni, said. However, his potential replacement, Matteo Salvini, the leader of the Northern League party, did not mince words when condemning the attack. “We are still looking for Saddam’s ‘chemical weapons,’ we are still paying for the crazy war in Libya, and someone with a quick trigger finger is insisting on ‘smart missiles,’ only helping the nearly defeated Islamic terrorists. Total madness, stop it,” he posted on Facebook. Sweden, which is a member of the EU but not of NATO, also called for the Syrian question to be resolved within the framework of the UN charter and international law, careful not to bring up the fact that both have been violated by the US, the UK and France. Latin American leaders also called for solutions within international law. Peru, which currently chairs the Security Council and is hosting the Summit of the Americas in Lima, called for moderation from all parties and backed a “political solution” for Syria, according to its foreign ministry. “It’s time to find permanent solutions based in the international law to a war that has been going for far too long and ended too many lives,” Brazilian President Michel Temer told the leaders at the summit. The bombing of Syria reminded Serbian President Aleksandar Vucic of the NATO attack on his own country in 1999. “Being on the side of power does not mean being on the side of morality and justice,” Vucic said, emphasizing Serbia’s current military neutrality.